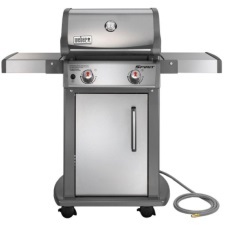 The stainless-steel Weber Spirit S210 model #47100001 natural gas grill is not capable of being used with a propane tank, so you will have to have city gas plumbed into your BBQ pit, deck, or gazebo. Therefore, if you prefer propane or you’re in an area where there is no natural gas pipeline, Weber makes many grills for propane, as well. But, for me, if natural gas is an option, it is just so much more convenient than a propane tank. And, if you have ever run out of gas in the middle of a Fourth of July celebration BBQ and no one would deliver because of the holiday, you will probably agree. I heard one argument that you could get the grill hotter using propane gas. Now, I’m no scientist, but if you can get this unit up to 1000° F, why would you need anything hotter than that, except to melt glass? This is not your Weber Original Kettle, with this gas grill you have a 360-square inch grill on which to cook a whole 20-pound holiday turkey while you bake potatoes on the 90-square inch warming rack if you wish, or a bunch of burgers and hot dogs while the buns warm on the rack. If you haven’t seen the improvements Weber has made to the Spirit, then you are in for a treat. The new Cookbox and shroud, the infinity ignition, the grease management system, the Flavorizer bars, and so many more. Many of those improvements came from suggestions and feedback left by Weber customers down through the last 30 years or so that Weber has been making grills. Weber also makes another version of the NG grill which has an output of 32,000 BTU’s and 424 sq. in. cooking surface and might be better for you if you want a slightly larger grill with similar features. It is the Weber Spirit E310 and is a favorite among BBQ’ers as well. The cookbox, which houses four new or improved components for your grilling pleasure, these four are the burner tubes, the cooking grates, the Favorizer Bars, and a grease management system. This cookbox with improved shroud is made from cast-aluminum, which is efficient and durable because it is capable of withstanding very high temperatures, like those used to sear your steaks. The Flavorizer bars will help with that, as we will discuss later. That cast-aluminum requires very little maintenance or care, allows for an even circulation of heat, and can be used for smoking and as an oven. The system is basically the same as the old dome kettle cover but with many improvements. The Weber Spirit’s burners use state-of-the-art single piece stainless-steel, which makes it stronger and more rust-resistant than the old burners, which lasted for decades without the burn-through many experienced on other grills. And, the cast-aluminum is much easier to clean than previous burners. The Spirit’s cooking grates are made with three high-performance metal combinations, porcelain-enameled cast-iron, stainless steel, and porcelain-enameled steel. Although there are slight differences in each alloy combination, Weber has discovered which works best for which utilization. Each kind promotes heat retention and can sear your foods wonderfully with the stainless-steel rods giving your foods professional looking sear marks. Plus, the porcelain-enamel is easy to clean, with no seasoning required like plain cast-iron, so it’s less work and more fun. As the juices drip down from the meat, those juices are funneled to the grill’s Flavorizer bars, where they sizzle and create flavor for the meat and what isn’t vaporized into smoke flavoring is angled into a grease management system. This system is comprised of a slanted grease tray and a catch pan. That grease tray resides just beneath the grill’s cookbox a harmless distance away from the burners to avoid grease flare-ups. The grease is directed down toward the grease tray to the grease catch pan. Both the catch pan and the grease tray are very easy to clean. The tray just slides out easily from the cabinet, and whenever the catch pan gets close to full, just remove it and throw it away, then replace it because it is disposable. This Stainless-Steel Weber Spirit S210 Grill with Natural Gas will likely be the last BBQ grill you will ever own, it’s that good. We found 142 verified Amazon buyers who reviewed the Weber Spirit natural gas grill with an average rating of 4.3 stars out 5 stars. 87 percent of these customers rated the Weber Spirit either 4 or 5 stars. These are a few of the comments from the 140+ verified Amazon buyers left, “This is my first natural gas grill and I couldn’t be happier.” … “This is a great natural gas grill for family cooking.” … “Very easy to clean with convenient side plate holders that can easily be folded down for storage. Love, Love, Love this grill.” And, “Not as good as my old Weber, isn’t as hot especially to sear steaks.” Weber confirms that natural gas does not get as hot as propane. They recommend using the searing station, which was designed to sear steaks perfectly. In summary, this Stainless-Steel Weber Spirit S210 Grill with Natural Gas is a sturdy stainless-steel grill, which is well-insulated and airtight so that it can almost replace your kitchen oven. With its many innovations and optional add-ons, such as the smoker box and rotisserie, this may be the last grill you will ever buy.